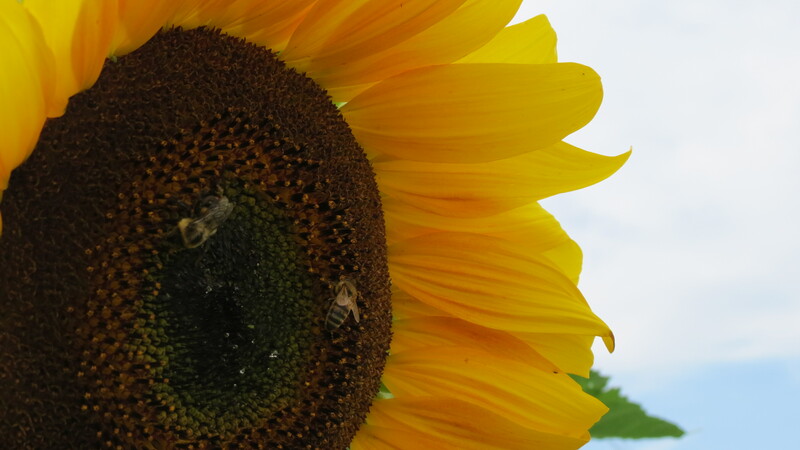 Each CSA will have a bouquet of sunflowers! Slice each pepper in half lengthwise then use a spoon or your fingers to scoop out any seeds and membrane to make space for your filling. Cut the bacon crosswise into ¼-inch-thick strips (also called lardons) then add the bacon to a pan over medium heat and cook until golden. Remove the bacon from the pan onto a paper towel. Add onions to the pan used to cook the bacon; additional fat should not be necessary since fat rendered while cooking the bacon will be left in the pan. Cook the onions, stirring occasionally until translucent. Add the garlic and cook for about 30 seconds. Remove the garlic and onions, set aside. Combine both cheeses. Add the bacon, onions, garlic, sliced green onions, the zest and juice of a lemon, red pepper flakes, dry oregano and salt. Stir to combine. In another bowl, combine breadcrumbs and parsley with the melted butter. Spoon the cheese mixture into each pepper half, place filling side down into the buttery breadcrumbs then place filling side up onto a baking sheet. Bake the sweet pepper poppers for about 20 minutes or until the peppers have softened and the breadcrumbs are crusty and golden brown. Serve then watch the poppers disappear. 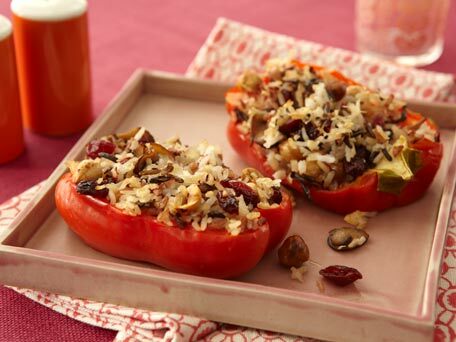 How about some stuffed peppers? Melt butter and oil together in a 2-quart heavy saucepan over medium heat. Add onion and cook, stirring occasionally, until softened, 3 to 5 minutes. Add mushrooms and cook, stirring, until liquid given off by mushrooms has evaporated, about 5 minutes. Add rice and toast, stirring, until fragrant, 1 to 2 minutes. Combine 1/2 cup chicken broth with 1/2 water and stir into rice. Simmer, covered, until rice is cooked through, 45 to 50 minutes. Let stand, covered, 10 minutes, then fluff with a fork. While rice is cooking, put hazelnuts on a baking pan and toast until golden, 6 minutes. Place in a kitchen towel and rub off any loose skins, then chop. Transfer to a bowl with cherries and cheese. 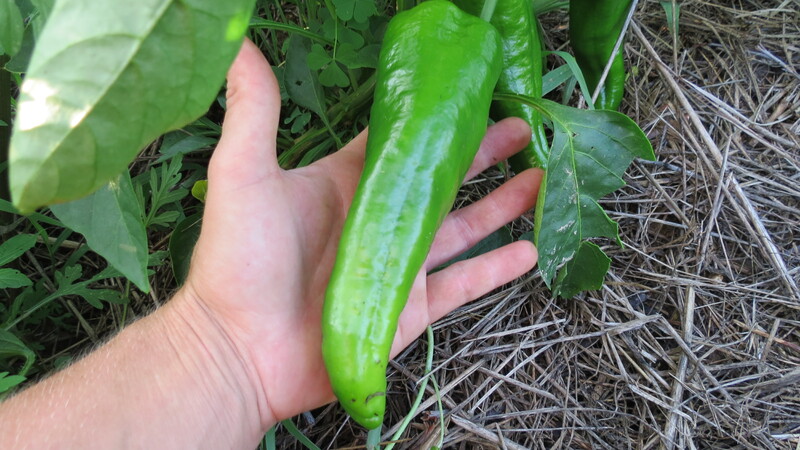 Halve peppers lengthwise through stem, leaving stem intact. Remove seeds and white ribs with a small sharp knife. Add rice to ingredients in bowl along with vinegar and stir to combine. Season to taste with salt and pepper (about 1/4 teaspoon each). Arrange pepper halves in baking dish and divide mixture between each. Pour remaining 1/2 cup chicken broth in dish (not on peppers). Cover tightly with foil and bake until peppers are softened, 35 to 40 minutes. Remove foil and bake, uncovered, to brown and crisp tops, 10 to 15 minutes more. Let cool 5 minutes before serving. Make ahead: Rice mixture can be cooked 1 day ahead and kept covered and chilled. Bring to room temperature before stuffing peppers.